SILOPI, TURKEY, 18 August 2014 (IRIN) - As soon as he crossed the border into southeastern Turkey, Khudeda Khalaf downed a bottle of water and called his aunt’s cell phone, praying that she and her family had made it to safety. “But the voice that answered spoke in Arabic,” the 41-year-old, said, confirming his worst fears that his relatives had been abducted by members of the Islamic State (IS), a jihadist movement formerly known as ISIS. He speaks Kurmanji, language of Iraqi Kurds including the Yezidis. “We still don’t know if they’re dead or alive,” he said. “And now all we can do is wait,” said Khalaf, one of an estimated 200,000 Yezidis who in the past two weeks have fled their homes around the town of Sinjar in northern Iraq to escape the IS advance, and one of 2,000 who have gone to Turkey. Followers of an ancient religion related to the Zoroastrian faith, Yezidis worship a deity called the Peacock Angel, who was supposedly temporarily cast out of heaven by God. As a result, Yezidis are often branded devil worshippers. 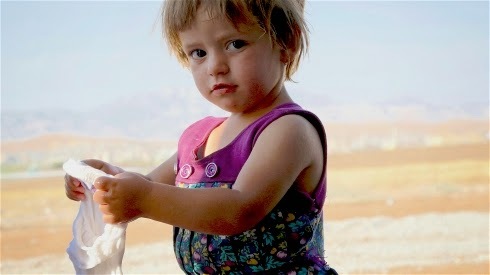 Along with Christians and other non-Sunni Muslims, Yezidis are little tolerated by the hardline Sunni Muslims from IS. Large numbers of the community, believed to number 500,000 in Iraq, have been killed in recent weeks, according to reports. “The Yezidi are peaceful people. We don’t hurt anyone,” said Dawd Sulyman, 21, who left his home in Sinjar by car on the morning of 3 August and arrived in Turkey that evening, via the semi-autonomous Kurdistan region. Sulyman told IRIN how he had woken that morning to discover the Peshmerga, soldiers from Kurdistan who had been holding a front line against IS since their advance into Mosul in early June, had retreated. The majority of the displaced Yezidis fled northwards into the Sinjar mountain range where tens of thousands got stuck for several days without food, water or shelter. Yet others have decided instead to flee Iraq altogether. Sulyman, who travelled with his passport, said he decided to go to Turkey, rather than stop in Kurdistan because it was “one step closer to Europe”. Residents of Silopi, just inside Turkey, where a reception camp has been set up by the local municipal authorities, have welcomed the new arrivals, who number around 1,600, providing them with food and medical care. Steffan Hasan, a Swedish doctor and himself a Yezidi, had cut short a vacation in Istanbul to volunteer in the camp. He said most people were suffering from dehydration and there were many cases of “psychological trauma”. “They don’t speak, they can hardly eat. They have seen horrible things,” he said. The medic recounted a story he had heard from one of his patients: that two boys who had been on Mt Sinjar had ventured out under the cover of night to fetch food and water for their starving families. Hanifa, a mother of two, told IRIN how she fled her village of Khanazour after hearing that armed fighters had executed two men and taken their wives. The Turkish government has publicly claimed that it has opened its doors to Yezidis. But some refugees at Silopi camp told IRIN that those who did not have passports were not being allowed in and were being turned back by Turkish soldiers. Others said they paid smugglers up to US$500 to be able to get across the border. While Habur is the official border point for those with passports, the tiny village of Ovacik, several miles south of Silopi, is the first stop for Yezidis crossing into Turkey without documents, but residents there say that for many, it is also the last. A local farmer, who gave his name as Sabri, whose house looks out on the Hizil river that divides Turkey and Iraq, told how he had watched as a group of some 150 women and children arrived earlier that day, waving a white flag as they made their way up the bank. Minutes later, he claims, Turkish soldiers swept in and sent them back. “We gave them water and bread, even our shoes,” said Sabri, 43. “Nobody is helping these people.” IRIN was not able to independently verify these allegations. Several aid workers on the Kurdistan side of the border said they had seen thousands of Iraqis queuing up to get into Turkey in the days after people first fled Sinjar, but that the lines had since died down. Turkey has its reasons to keep its borders tight. It is already supporting a caseload of more than 800,000 Syrian refugees and as IS continues its advance, it will naturally be on guard for militants entering. The country’s focus, therefore, is instead directly supporting aid efforts to help the displaced across the border in Kurdistan. According to Fatih Ozer, director of Turkey’s Disaster and Emergency Management Presidency, or AFAD, the government plans to contribute to the construction of a UN camp for 16,000 people to be located on the outskirts of the Iraqi city of Zakho, in the Kurdish province of Duhok. AFAD is also building a 22,000-person camp for Iraqi Turkomen in nearby Dohuk, he said, and also plans to send supplies of food, blankets and tents across the border. The move to set camps up inside Kurdish Iraq, rather than at home, is a reflection of Turkey’s increasing spending on humanitarian aid. In 2012, it became the world’s fourth largest government donor of humanitarian aid and the largest non-Western provider of development assistance outside the Organisation for Economic Co-operation and Development (OECD)’s Development Assistance Committee (DAC).